Whose vote will tilt the scales at the next RBI meeting on Nov 19? 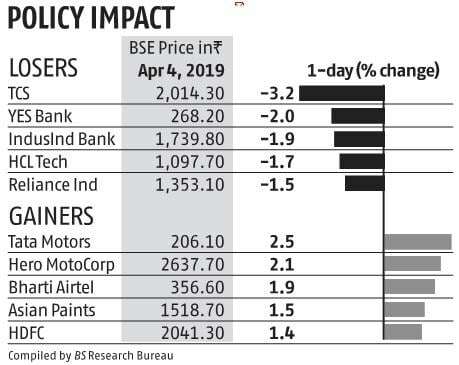 The benchmark indices retreated for a second day from their record highs after the central bank cautioned on signs of weakening economic growth, and cut borrowing costs for the second time this year. The Sensex closed 192 points, or 0.5 per cent, lower at 38,685 after swinging between gains and losses. The index came off nearly 350 points from its day’s high. The Nifty declined 46 points, or 0.4 per cent, to end at 11,598. The fall in the rupee and bond prices also weighed on investor sentiment. The rupee ended at 69.16 against the dollar, as compared to Wednesday’s close of 68.43. The 10-year government bond yield rose to 7.35 per cent as compared to the previous day’s close of 7.27 per cent. Yields hardened despite the RBI lowering rates by 25 basis points, a widely expected move. Most economists surveyed by Bloomberg had forecast the central bank to lower rates. “What came in the RBI policy was expected and the market is now worrying about growth, monsoon, and the election outcome,” said A K Prabhakar, head of research at IDBI Capital Market. “Investors turned cautious about the downward revision in GDP growth to 7.2 per cent for FY20, while premium valuation and concerns over monsoon further impacted sentiment,” said Vinod Nair, head of research at Geojit Financial Services. Foreign portfolio investors were net sellers for the second day in a row, showed provisional data by the stock exchanges. On Thursday, they sold shares worth Rs 226 crore, extending their 2-day selling to nearly Rs 1,300 crore. Domestic institutional investors were net buyers to the tune of Rs 1,200 crore. 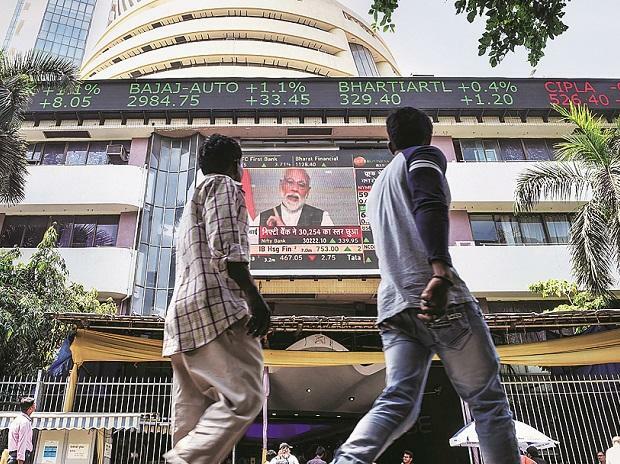 Foreign investors have pumped in above $8.5 billion into India stocks so far this year, on expectations that rate cuts and the prospective re-election of the incumbent government will support earnings growth. This puts the country on track for the largest annual flood of overseas capital since 2014, when Narendra Modi became the Prime Minister. India on Tuesday became the first among markets valued at more than $1 trillion to reach a record this year. Thirteen of the 19 sector indexes compiled by BSE posted losses, led by the IT and Oil & gas indices. Meanwhile, 17 of the 31 Sensex members and 26 of the 50 Nifty stocks declined. Tata Consultancy Services and Yes Bank dropped the most on the benchmark gauge.